Dongli Lake, an artificial lake with 2 km² water surface and 21 km of shore line, is located on the central development axis of Tianjin, between the central city and the coastal new areas. 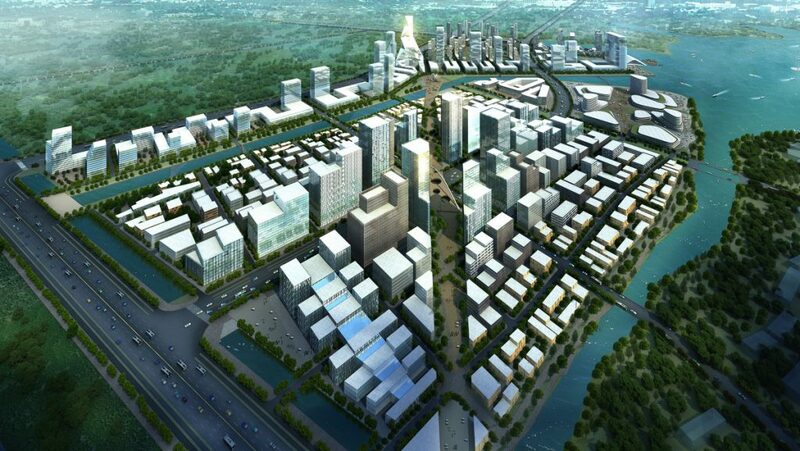 South of the lake is the major economic development belt; the area is among those with the highest development potentials of Tianjin City. The lake has an immense potential of various leisure uses for both residents and visitors, but also as place for doing business. With its attractive location and landscape, the planned ‘Central Business District’ has all prerequisites for a successful development. 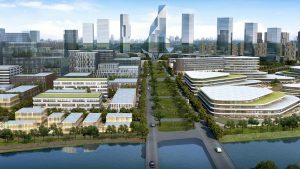 Tianjin Dongli Lake Construction Development Co., Ltd.
Continue reading "Dongli Lake CBD"
Maintaining stability and durability of the overall planning while being flexible to implement a diversified architecture, is the key to every sustainable urban planning. More than that, a sound urban design is able to shape a bigger image that echoes the remembrance of other cities in the world: The Central Plaza with its radial street system can make people envisage ‘Potsdamer Platz’ in Berlin with its combined performance of contemporary architecture. The echoing between landmark buildings and landscape axis reminds of powerful spatial gestures like ‘La Défense’ or ‘Champs Élysées’ in Paris. The planned large-scale glazed shopping arcades will remind people of the vivid ‘Galleria Vittorio Emanuele’ in Milan. 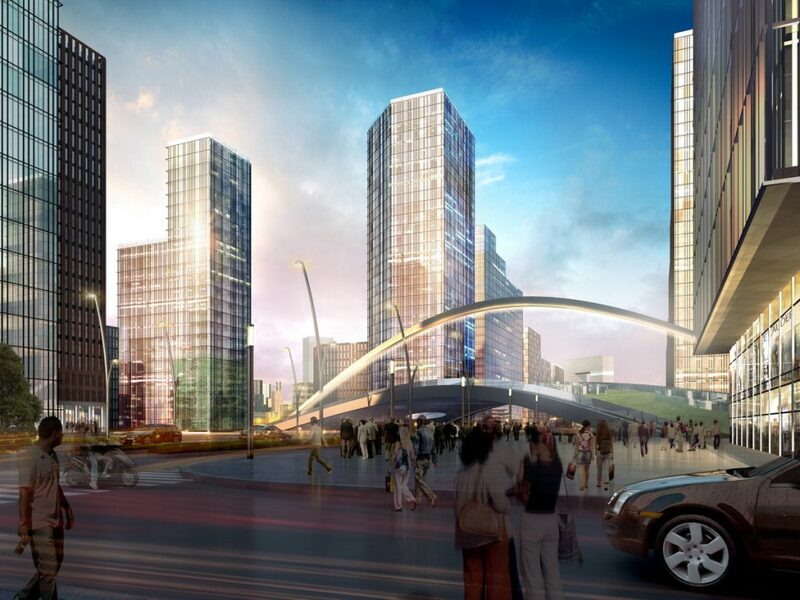 But the urban planning recalls as well images of Tianjin with its own unique cityscape. 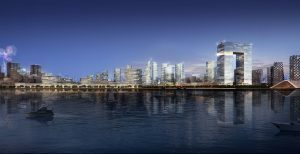 The pleasant pedestrian and business spaces along the river evoke the charming city quarters between Haihe River and Race Course Road. 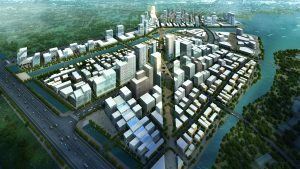 At the same time, Dongli Lake CBD is equipped with its own unmistakable features – functional, pragmatic and poetic ones. 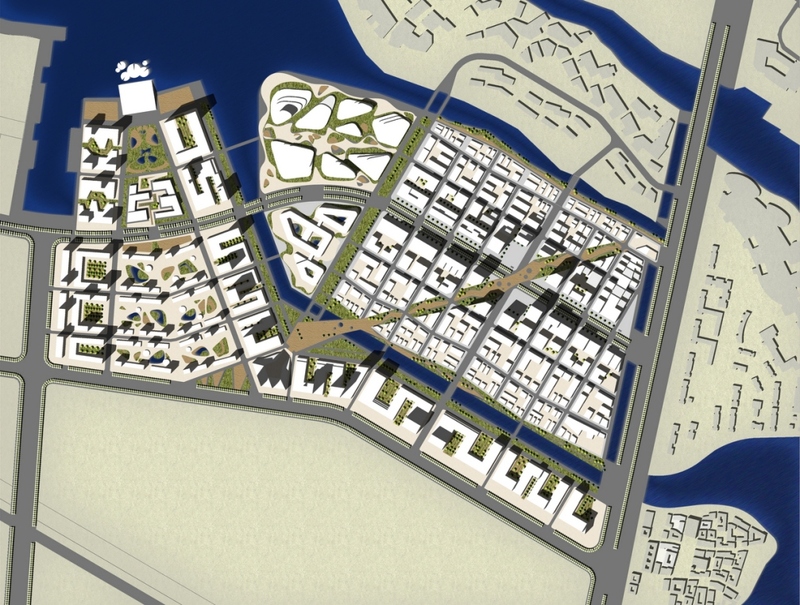 The planning area is divided into 3 parts: Two business areas north and south-west of the watercourse, as well as a central Cultural & Administration Area between those two. These three main plots consist of different secondary plots with multiple connections, shaping a graduated hierarchy with corresponding landmark buildings. 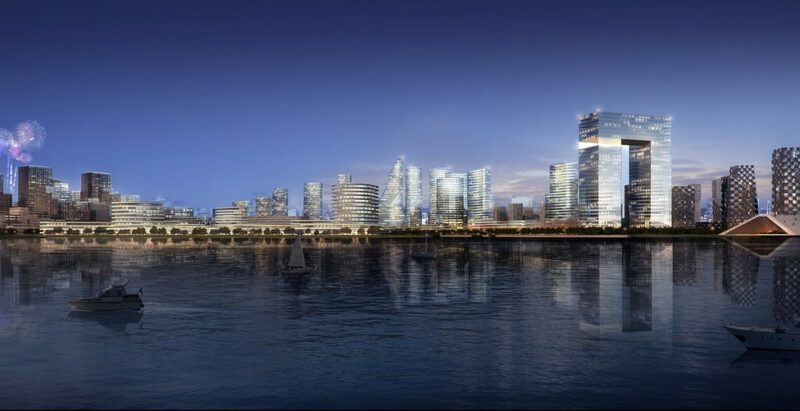 Waterfront towers are forming the corporate image of the whole district with a powerful skyline of high-end offices, hotels and business facilities. Landmark buildings in the river-bend area, overseeing and protecting the whole district, will create a visual name card for both Eastern and Western Lake. 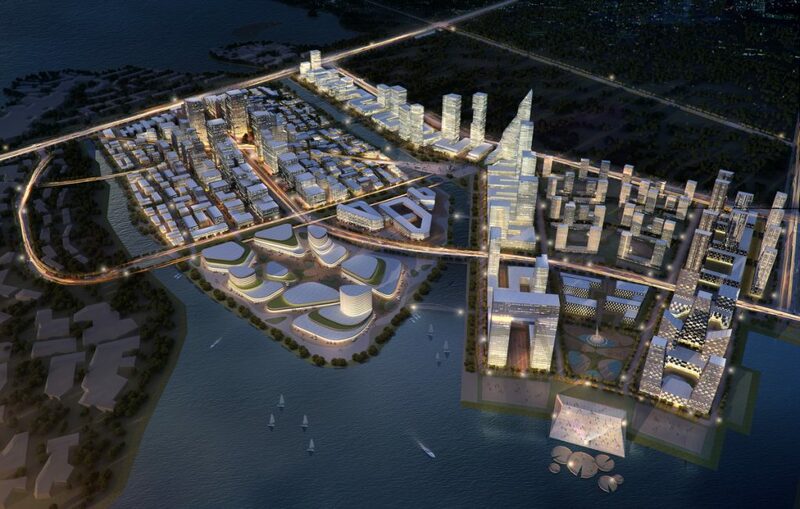 The central plot with its mix of culture, entertainment and leisure accommodates the district’s Administration Centre, Museum, Music Hall, Theatre and various recreational facilities close to the lakeshore. Curved buildings embedded in an organic landscape transport the idea of communication and culture. In the northwestern tip of the site, a unique studio building can host outdoor music festivals as cultural brand of the entire Lake District. The audience can directly view the floating stage on the lake, with the landscape as natural stage setting. The existing water landscape has been developed; additional landscape features have been integrated, focusing on sports functions, meditation and recreation. 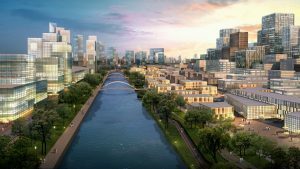 People will enjoy an exciting mix of green relaxation and dynamic recreation, and experience agreeable lakeshore promenades and splendid riverside environments. Two landscape axes are forming a unique double corridor that makes full use of the most attractive places as well as the wetland system between lakefront and riverside. 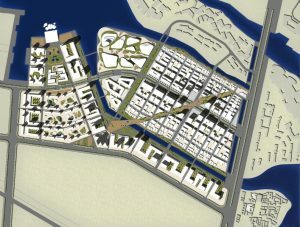 A carefully designed landscape bridge with various shapes is crossing the district diagonally and connecting various transportation nodes. Each intersection opens views to multi-layered courtyards, view axes and landmark buildings. 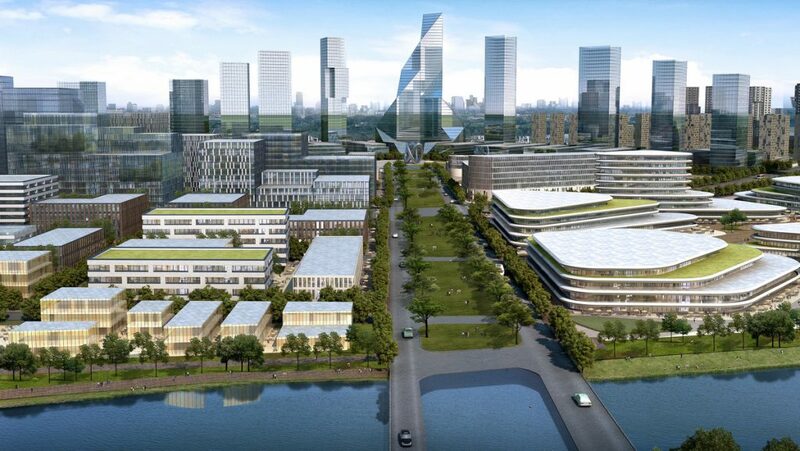 Tianjin Vision City Development Co., Ltd.